What more a student wants if he is provided with an online learning tool that incorporates social networking features!! 21st century students always find it interesting to work online, so it’s a great idea for educators and administrators to engage students with educational social networking sites. Imagine the way your students feel if they have a blackboard with Facebook like features: if you want such an online tool, Lore can be an answer for you. Lore brings you a great learning platform that allows educators, students and higher education professionals to explore, discover and learn. “We want to build what Facebook has done for your personal life, but for your school”, said CEO Joseph Cohen, Lore. Lore is a community of curious people, spanning every discipline, campus, country, and age. It’s a platform for learning: a new venue for education that allows you to explore. It’s a place where everyone can freely teach and learn. Let’s learn about Lore’s principles quickly. Be an artist: Treat your work as a craft. Your creation resembles you in it. Learn: Learn beyond your abilities. Stay curious and learn from your mistakes too. Break rules: Rules are meant to be broken. Challenge authority and ignore the status quo. Own: Think like a boss. Focus: Eliminate distractions and simplify everything. Think Big: Why be ordinary if you can be extraordinary! Push: Push yourself beyond the boundaries. Create an account by entering your name & email address. Once you’re done, you are asked to enter the course you want to create, a code which is optional (It’s for your students to log into your course), name of the school or institution you’re teaching at and the topics your course covers. You can also enter when your class meets (for example, Fridays from 10:00 AM to 1:00 PM) and when it starts and ends (dates). You can choose any of these two privacy options: Public Course & Private Course. Setting privacy to “Public course” allows outside students as well to audit your course, but they will not be able to participate in the discussion. Meanwhile the other privacy option allows only the people who have enrolled to see the contents. Once you’ve entered all the basic information, everything will be set to start your course. It’s very simple to understand the options on your course’s home page. This feature is to add students, instructors and auditors for your course. You can invite them by entering their mail ids or you can give them a code that appears on the screen. This code helps them to join your course on Lore.com. This option allows you to add contents to cover in the course. This is a resource center for your students where teachers, auditors and instructors can add books, links and files relevant to the course. Here you can add time table, events, assignments and exams details. You can edit your course details here. It’s the place where your actual teaching commences. You can post your lesson, add files, suggest books to refer, etc. Students are able to comment their doubts, submit their works and share them with others too. The above mentioned are the basic features we need to know to run a course with Lore. There are a few more options like creating multiple courses, joining in others’ courses and creating groups for a project, quiz, common interest, etc. 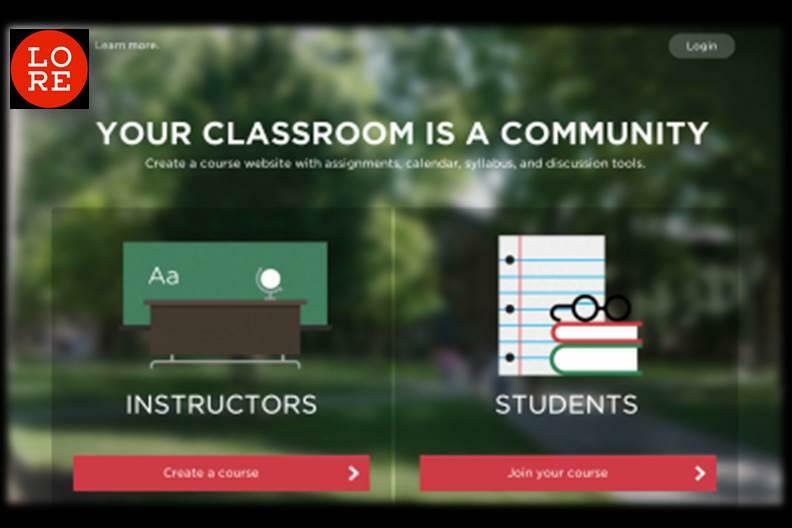 Lore gives classes an online presence that is modern, easy to use, and social. We hope this information is useful for you to know about this educational social network.